Story in the Fresno Bee and also the Washington Post. "This can happen because rattlesnakes are not tolerated in urban areas of the park. We win the battle but we lose the war." Maybe this article has already been posted on the WZ, but I can't find it. Below the article about the Hantavirus I found the following article which makes me want to cry....I love Yosemite....I love staying at Curry Village. rare hantavirus deaths have occurred elsewhere from mice, like in trail shelters on the AT here in the East. it is rare... far more people die swimming, or getting hit by lightning. Since it is so rare, I wonder... Is the infection rate very low, or are many people exposed while only a few become seriously affected? I understand even polio is like that -- only a few are/were hit by the serious effects, while very many showed they had been exposed and had antibodies against the virus. That poor gentleman I stayed with my parents in Curry Village for a couple nights in June when they visited. So many things to worry about out there that could hurt us. Guess it just wasnt our time yet. I feel for his family. Now I'm gonna hafta add the hantavirus to my list of things to be neurotic about. More info here and a pic of a deer mouse. CNN is now reporting 1 more dead after contracting hantavirus at Yosemite National Park. "Hantavirus cardiopulmonary syndrome is a rare but often fatal lung disease that kills about a third of those who get infected. Don Neubacher, Yosemite's superintendent, noted that people typically don't fall ill with hantavirus until between one and six weeks after they are exposed." SteveC, CaT & I were there several weeks ago, we didn't stay in the hantavillage, but did enjoy a hantapizza at Curry. Park officials are now stating that as many as 1700 Yosemite visitors may have been exposed to Hantavirus. Details here. "The rustic tent cabins of Yosemite National Park — a favorite among families looking to rough it in one of the nation's most majestic settings — have become the scene of a public health crisis after two visitors died from a rodent-borne disease following overnight stays." symptoms appear 1-6 weeks after exposure...so...is it just a statistical guess that the commonality of those 2 people visiting Yosemite is how they attribute Yosemite mice to the disease, or...could they have caught it somewhere else from other infected mice (yes) and we just don't know where? I just found out that hantavirus pulmonary syndrome was once called "Four Corners Disease" so these travellers might just have been exposed somewhere else on their western journey, and all roads lead to Yosemite for many of them. There are hundreds of tents, thousands of visitors (incl me) who have stayed there .We have no public knowledge of the unfortunate deceased person's immune systems, either, and that may have been a huge contributing factor. I hope they don't throw out the baby with the bathwater, ie, Curry Village. All the victims stayed in the cabins between June 10 and June 20, and all four known cases were contracted by people who stayed within 100 feet of each other but not necessarily in the same cabins. This of course makes it sound much more statistically likely, but I make the case here for care in interpreting ANY scientific conclusion (such as climate, for example) as sometimes more difficult than it seems at first glance. "Captain Charles Higgins, director of the National Park Service public health office, said that park officials decided to close 91 tent cabins after finding rodents nesting between the double walls of the cabins." "Our current thinking is that the design of these tents -- double walls -- provides rodent space," Higgins said. "We can't get to it to clean it." this may be the way to de-people the Valley as it is a goal of some anyway. I'm not saying that is good or bad, as both sides have good points, but all these rationales are provided by Mother Nature and therefore may be more supportable. I completely agree with you, Harvey. They are reporting 4 new cases for a total of 6. I think it should actually be 7. Tear down Camp Curry? Heck no! There are ways of dealing with the Deer Mouse problem other than removing the buildings - the mice will just find other accomodation. (There is plenty of online information on how to deal with Hantavirus.) Even so-called mouse-proof buildings prove to be no obstacle to determine rodents. Wherever there is food, the mice will gather. Here is an update from the Fresno Bee. "At least six rangers are staffing phones at Yosemite National Park as visitors frightened about a growing outbreak of a deadly mouse-borne virus call seeking answers. A park spokesman said that more than 1,000 calls a day are coming into the park, many from visitors wondering whether they are in danger of contracting or being exposed to hantavirus pulmonary syndrome." There is an interesting thread by eeek on our sister site Yosemite News & Information. Some are even advocating the introduction of hantacats to the hantavillage... We know how that works out! If you were to draw a 100-year rockfall line on the Valley floor, inside the cliffs, then a 100-year flood line outside the river path, you would end up with an elongated doughnut area where it would be mostly safe for the tourist. Something like a thousand acres. A place for permanent buildings for sleeping/congregation & the like. That would make the lawyers happy. The rest of us, knowing and prepared for the dangers could then happily romp around the real Yosemite. Now, just for fun, the Empire State Building occupies a pad of around 2 acres (I'm sure the Curry Village stores occupy more space), and is less than half the height of the Valley walls. It hosts 4 million visitors a year, about the same as Yosemite! It's all relative. The 100 year thing is not as safe as it sounds. We learned a bit about that here in Richmond. After Hurricanes Camille in 1969, the "can't happen again flood" of Agnes came just 3 years later, and was even more record setting. Health officials say a West Virginia resident has died from the outbreak of a rodent-borne illness linked to Yosemite National Park. 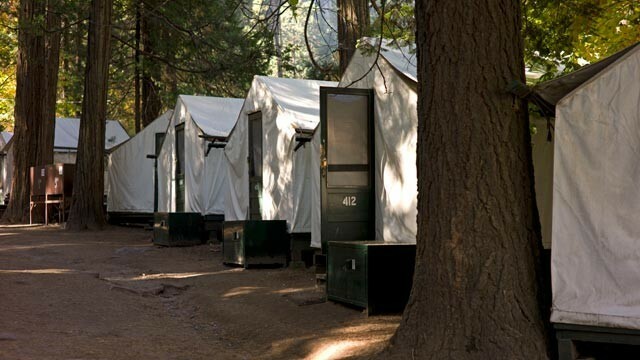 "Last week, Yosemite National Park officials said up to 10,000 people who stayed in certain cabins might have been exposed to hantavirus pulmonary syndrome. Gupta says the virus has now killed three people and sickened five others." Generated in 0.163 seconds in which 0.137 seconds were spent on a total of 15 queries. Zlib compression disabled.